Which new TLD is on top? Here’s one answer. Search data shows that .directory is winning in terms of total indexed pages. No, this article isn’t about whether .xyz or .club should be considered the most registered new domain name so far. Instead, it’s a different look at how to measure the most successful new top level domain names. 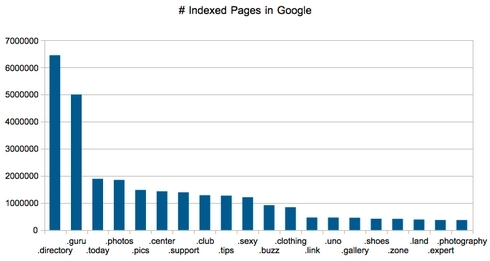 This chart represents total indexed pages, not unique domain names. You might expect .directory to come out on top given that directory sites have, by definition, a lot of pages. It also makes sense that .photos and .pics are ranked above .photography despite having a lot fewer registrations. Photos (pics) are more numerous that photographers; a photo site has a lot more pages than that of the typical photographer. Some domain names are dominated by a handful of sites. Fotos.directory takes up basically positions 6-25 in the results for site:.directory. Obviously, this way of measuring relative “success” is not perfect, but it’s one more way to rank domain name success so far. This entire chart is a rounding error compared to some existing new TLDs, but it’s not fair to compare to domain names that have been out for a decade. There’s a whole lot of forwarding going on. 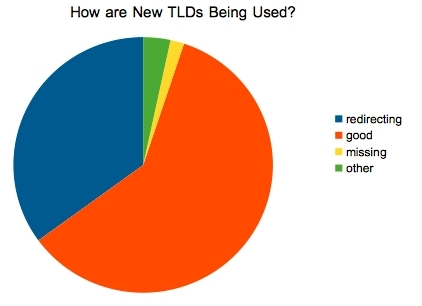 35% of indexed URLs for new TLDs are forwarding to another site. (I noticed that a number of .link domains are being used for URL shorteners and these are getting indexed.) 60% are resolving to the matching website. So who’s #1? .Directory, by at least one measure. (in the case of .directory) and reported the hit count from the first page, that’s *not* a sound method. As most folks should be aware, the Google hit count is just an estimate, and the estimate actually *changes* once you go deeper into the search results. For .clothing, the first page estimated hit count is 854,000, but eventually drops down to just 398 (not 398,000, but 398, LOL). Deliberate Re-direction: Registration under a specific and purposeful TLD might be intended to be a quick-shortcut to a sub-page of a primary website. .UNO highlited this as a method for Spanish speaking consumers to more rapidly access Spanish language content that might otherwise be many links (and perhaps not clearly found) deep inside an English-language version of a website. Temporary Re-Direction: Transitioning from a domain to a new one is a nuanced process if one hopes to maintain their ‘Search Engine Juice’. Google’s Matt Cutts and other Search Engine Marketing thought leaders reccomend a gradual and measured transition over a duration of time. This ensures ranking benefits of an existing name are not lost. I think given these results, the authors of the report should redo things, or explain their actual methodology. Hi George! I collected the data. You’re absolutely right, there are many limitations to this data. It’s just intended to provide another point of comparison amongst TLDs, inspired by .Club’s recent blog post defining success as # of active websites (which is a much harder metric to measure than # pages indexed). The reason for the drop-off is not because Google’s estimates are off by several orders of magnitude, but because each of these TLDs have a lot of pages in Google’s supplemental indices, which is understandable if you consider that most of these are brand new sites and therefore not very important in the eyes of a search engine (which is what determines which sites end up in the supplemental index, and which end up in the main index). If you click on the “repeat the search with the omitted results include” link, you can see all of the results in the supplemental index — even though Google doesn’t consider them important yet, they still are legitimate pages on legitimate websites (at least, to the extent that any of them are! ), which is why I thought the total indexed pages number was a more valid comparison than the # of indexed pages in the main index only. Those results are pretty meaningless, because a few database-driven sites with automation can produce millions of pages. It doesn’t mean that they’re ending up visible on any competitive search queries by users. Great data point! I did look at a few other metrics for approximating # of active websites (which, as you point out, doesn’t say anything about traffic), but everything else seemed even more limited than Google’s # of indexed pages. I agree with you full George. Ironically .XYZ may become the first new gTLD to break 100K. Now how many of those registrations ever become websites is another question entirely. The really interesting thing will be to see whether or not these numbers have any correlation with renewal rates once those roll around. I know it hasn’t historically been the role of the registry, but wouldn’t it be awesome if registries who are the “good guys” and invest in their customer’s success with advice, tools, co-promotion, awareness-boosting, etc. end up getting rewarded financially? Anyone interested in these two? How much are you willing to pay me to take it off your hands ???? You two seem to have forgot the internet is still VERY YOUNG. It’s a new-born-baby in the grand scheme of things and within OUR lifetime, the .com will 100% become a distant memory. They will still have value but only as the internet’s first antiques. It really amazes me that people don’t seem able to comprehend how insignificant .com’s will become for the internet. These new gTLD’s will 100% change the way people use the web. It will become a more structured and logical network. These changes have been planned for a VERY long time. They tested the concept almost 15 years ago with the introduction 7 gTLDs including .info. That was the most erroneous posting I have ever read. The gtld’s will clearly fail and soon too. To think otherwise is delusional. It’s funny how people think the same thoughts at the same time. Just Saturday, I had set myself up to grab exactly the same numbers using the Bing API. Beat me to the punch! Thanks for saving me time, Matt. Late minds think like to think so. The Google site: operator is incredibly flakey and a extremely poor way of measuring development. Google can’t even solve a simple webspam issue (“natural” and “unnatural” links) so there will probably be duplication and false attribution in those figures. The classifications do not look like those of a real web usage and classification survey result. (I appreciate that it is not meant to be one.) That’s a highly specialised thing because it is the precursor to building a search engine index. You’ve got to be a search engine developer to understand all the wonderful ways that people can break even the simplest of HTML. There is no breakdown on usage or PPC so even a simple holding page might qualify as an “active” website. I run a survey of approximately 350K domains each month and the parser with the largest number of REGEXs is the one for parsing holding/coming soon pages. The holding page parser used for the larger (>1M domains) surveys is even larger. Some registries get worried when they see the results of real surveys especially when they had been relying on dodgy methodology ones that classify redirects to Godaddy’s PPC lander for undeveloped domain names as a simple redirect (COInternet and its initial iffy usage “figures” which were more press release fodder than real development and usage analysis.) Others such as Eurid engage in limited surveys (5K samples) with a bunch of academics and students trying to classify usage and extrapolate that to the entire TLD – statistically sound but technologically iffy because of poor classification and misunderstandings about the nature of the Web. Analysis has to be done at HTML code level because it is possible to have what appears to be a site in one TLD that’s really a site in another because of incorrect DNS settings. So while a user thinks they are looking at a fully developed new gTLD website, they are really looking at a .COM or .ccTLD website. Right now, there seems to be a lot of scrambling for information about the new gTLDs and people are trying to convince themselves that their investment is will bear fruit in the future. Web development and usage surveys are how mainstream TLDs are distinguished from non-core TLDs. It is probably a bit too early to run surveys for some new gTLDs as they are still in Landrush phase. Domains tend to have lifecycles and in the Landrush phase, development and usage is not as high as that in a more mature TLD. Some domains can go for months or years without being developed while others can be up and running with full websites (or cookie-cutter WordPress installations) from the day they were registered. Individually, the new gTLDs are small enough to survey. It might be interesting to run a few surveys on the top new gTLDs later this week. Some of the results might not be what people expect. Given that Google is the viewport for many people seeing and getting to websites, it is an interesting number to watch – the number of indexed pages for a specific TLD. Best to understand this as simply the TLD’s footprint in Google, and look at it as a progress check for just that. Well I own quite a few new gTLDs and .DIRECTORY is outperforming them all in terms of traffic. I generate around 12 visits a day from MALL.DIRECTORY.